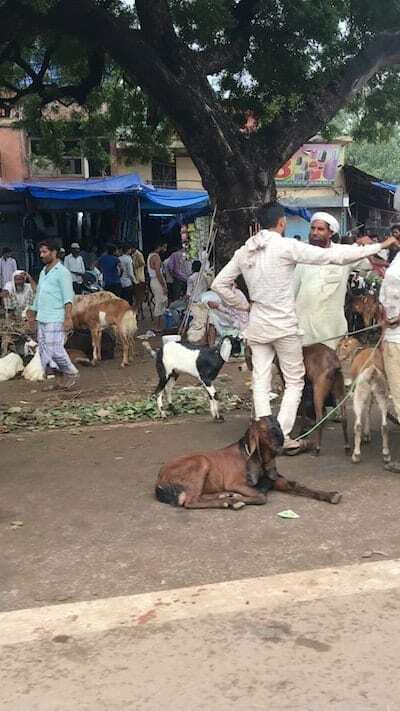 I did not expect to see much sign of Eid-ul-Adha in New Delhi, when I found myself there last year of the eve of the holiday, instead of back home. 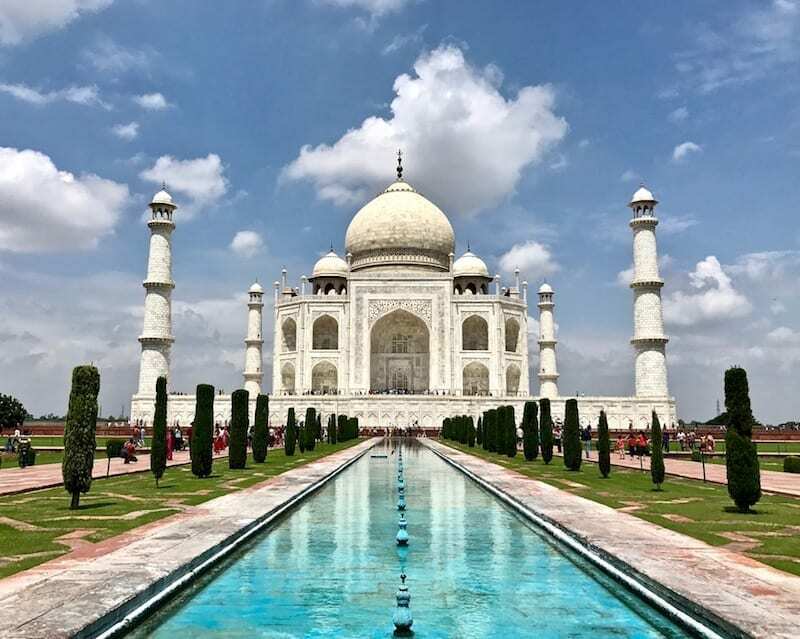 Although Muslims are a significant minority in India, I was in the touristy bit with the UNESCO Heritage Sites. Surely it was not a likely place to see anything related to Eid. But that day, I nearly bought a goat at an authentic Eid goat market. 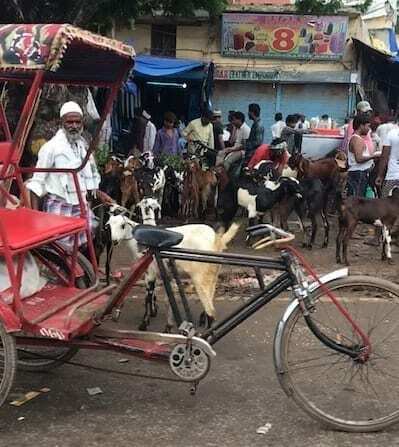 1 Where was the Delhi goat market? 1.1 What if… we were to buy a goat? 2.2 Should we buy a goat? 3.2 There is enough for need, but not for greed. 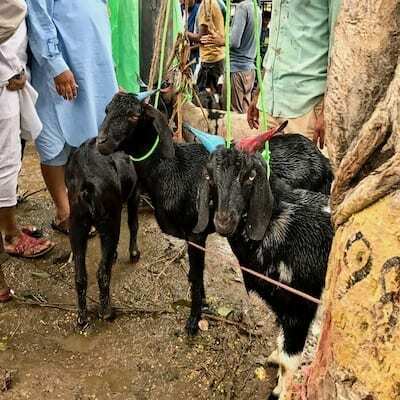 Where was the Delhi goat market? We saw the most bizarre sight from our tuktuk. We were en route to the start of the walking tour that the hostel organised, 5 random travellers out to see a bit of old Delhi. Along the road approaching the Red Fort, we suddenly came upon a gathering of goats. Immediately, all heads whipped around to verify we’d really seen what we’d seen. Black goats and white goats, mottled goats and brown goats, short goats and tall goats, goats with some kind of fashionable hairy humped behinds, garlanded goats and goats with short little horns painted bright colours. On the left, where there was a kind of open space, was a loose collection of men standing beside their goats. And on the right, right on the road divider, were more men and more goats. I knew what it was immediately. It was the eve of Eid, so it must be an Eid goat market. But it was possibly the maddest thing I’d ever seen. We recovered our presence of mind, and smartphones were whipped out to record the scene, so that we’d have proof of the bizarre scene before the tuktuk zoomed past the market. Why is the goat market on a road divider again? What if… we were to buy a goat? When the walking tour was over, we wondered where we should head to next. But all of us were secretly hoping to find our way back there. It was probably Cam who first said it out loud, pulling the veils off of our mutual curiosity. So after lunch, we found a tuktuk to take us back. The idea took hold immediately among my younger companions by its farcical nonsense. “Like a goat pet – we can walk around, travel with it for a while!” Various suggestions ensued for how this could be made to work – what it would be fed, and how it would be tethered. Getting off, we inspected our surroundings. The goats seemed incredibly tame, placidly standing by their handlers. They were gorgeous too – clean, glossy coats and healthy-looking. The best livestock, for the Eid sacrifice. I looked wider afield, as the other girls knelt to pet some of the goats. Pirmin had already begun filming on his phone again. From behind me, I heard the goat owners engaging them in conversation, after someone asked for the goat’s name. All around us, among the intermittent traffic, the goat market was surprisingly orderly. People were not shouting deals at passers-by or anything. Just standing with their animals and waiting for the interest. Buyers, leading their newly acquired goats across the road to transport them home. And the goats, whether tethered or loose, were orderly as well. Funny that. I had always imagined goats to be wayward animals (tip: search ‘Moroccan goat in tree’). Most of them obediently followed their new owners in blissful ignorance. One or two goats resisted. The smarter ones, I guess. I wondered if the area used to be a market junction, and these people were simply continuing their age-old sale at the same spot, even though now there’s a road right across the old market ground. By the time I came back to the group, the goat had been named Dave. They were halfway into really doing it. They had notions of rescuing Dave from being eaten. Well, it tends to happen, when you name something. I understood the feeling. The goats were quite lovely. Perhaps tame enough to really be pets. It was almost a shame to eat them. But on the other hand, my other side – the Asian part – understood them as food. I was looking at some pretty good quality chevon. We are still a region with many people who either still personally kill their own food, or kill the animals that threaten to steal the harvest. And across the thousands of islands in the archipelago, the only alternative to fishing is dependence on the mainland. I later sent a photo of the goats to my uni friends’ Whatsapp group. 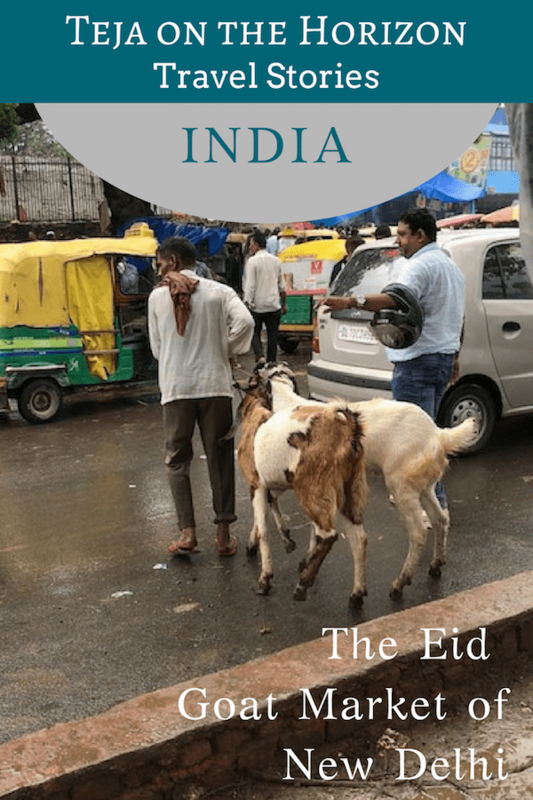 My friends – especially the men – immediately replied, approving the quality and choice available in the Delhi Eid goat market. Anticipating the bounty that was going to be distributed. One friend, though, was conflicted between the quality livestock vs its prettiness. Too darling to eat. Should we buy a goat? “10,000 rupees.” The man repeated with a smile. Probably waiting for us to begin haggling. It was absolutely daft. 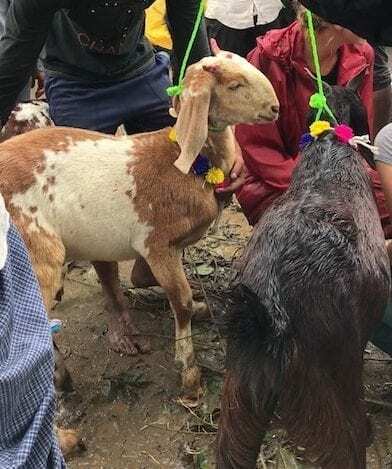 Part of me absolutely loved the mad idea of buying a goat from the Eid goat market, just for the sake of having done it. And of course, having a goat wandering about after us. I was incredibly tempted. But the other part, the political part, the cautious part, intervened with Common Sense. Aside from the practical aspects of caring for the goat while we had it, there was the question for what to do with it afterwards (we can’t keep it forever! and all of us were itinerant). And entirely separately, I was not sure what the local sensitivities were. On the one hand, they may not mind selling Dave to a bunch of young Europeans for their sport. But on the other hand, suppose they took it as a form of mockery of their Eid goat market? On the one hand, the media news of India tends to suggest inflammatory tempers. But there again, it’s also true that the global media gives a really distorted risk perception about pretty much everywhere. I was foreign myself, and did not know which one was the more probable outcome. Although it was his idea in the first place, Cam also began to have second thoughts. He asked me if it would be offensive. Responsible brain won out. Sigh. “It might be best not to,” I finally said. We bid the sellers goodbye. Perhaps Dave would not be bought after all, we consoled ourselves. As we zipped off to the Red Fort in our tuktuk, another tuktuk kept pace beside us in the traffic. A happy man in traditional white clothes was in it, along with his new goat who looked almost comically placid. He waved, and Cam waved back. “For the sacrifice, tomorrow,” the man called out, patting his goat. His tuktuk picked up speed, and zoomed ahead. I wondered how they organised the sacrifice, in Delhi. How similar would it be to Malaysian norms? Is there a common place where people lead their goats to, in the morning? Do they manage it better than we do? 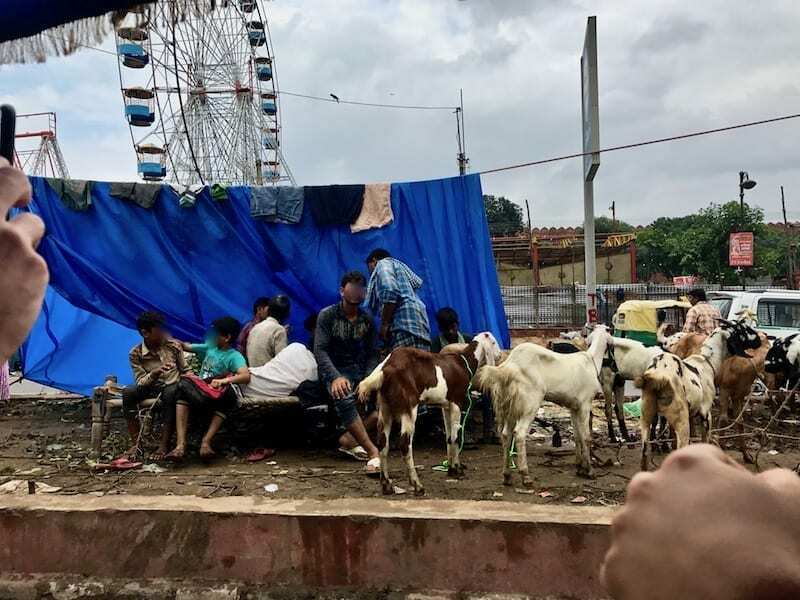 Watching the people in the Eid goat market after travelling across Uttar Pradesh, I thought back to my homeland, where livestock would already have been purchased by the donors days or even weeks before. 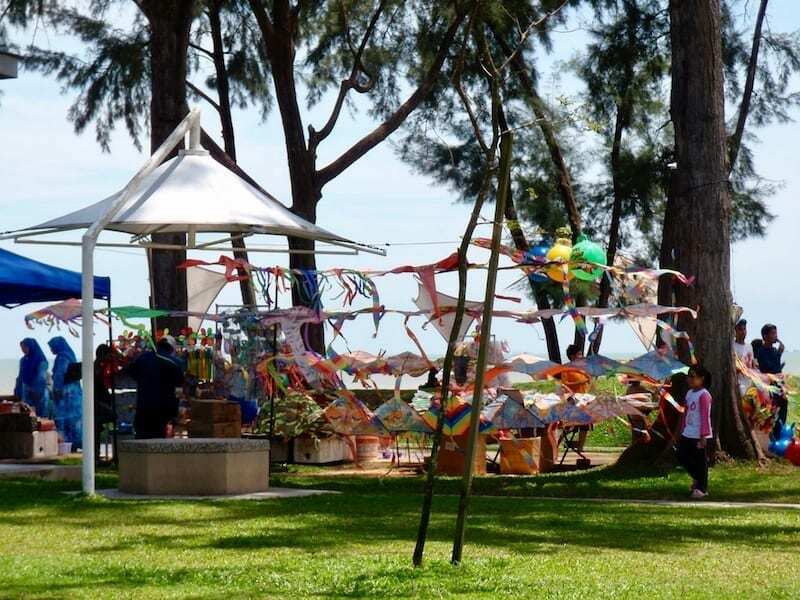 Malaysia is a country of relative affluence. In the past century, although we are not quite a developed country just yet, we have achieved the food abundance of developed countries. Along with its indulgence and its waste. But already in recent years, as the increasing wealth meant a greater number of Muslims can afford to participate in the Eid sacrifice, ideas germinated. Eventually someone thought, we already live in affluent neighbourhoods. Perhaps, instead of giving meat to ourselves who could all afford it, we should act as donors in places of greater need? From there grew the charitable organisations today working with regional Muslim communities such as Muslim Cham people in Cambodia, extending the hand of Muslim fraternity across the border. Some have even upgraded into social enterprises, where the rearing of livestock for Eid ul-Adha became a means of local income and economic dignity for the villagers left destitute following the massacres of the ardently atheist Khmer Rouge, which targeted the Muslims especially of all the religious communities in Cambodia due to their greater education and organisation. Yet others open options to donate the livestock to the refugee communities, many of whom are Muslim Rohingya, fleeing genocide in Myanmar. Malaysia is not a signatory of the UN Refugee Convention, and so there is no formal process for processing and extending support to refugees that make it into our borders, leaving many open to exploitation. But that does not stop private citizens from stepping into the breach. Still others confine their ideas to things more basic and closer to home – such as the new problems that stem from the ritual being now carried out in dense urban environments and at greater levels than traditionally. Were the logistics no longer aligned with the spiritual dedication of the act of sacrifice? What are the options to do better? There is enough for need, but not for greed. It is important for those discussions to take place, those ideas to be planted and tested and allowed to evolve. Separately, within our value system and culture, without the interference of louder and more evangelical cultures with different priorities. Every culture whose critical mass has reached leisure, needs to evolve their own version of a sustainable self-image. Our own Wakandas, in order to have a post-developing image of ourselves, that look and sound and feel like us. I reflect on these things often, and especially when Eid ul-Adha comes around again. The overt piety value of the sacrifice and the community value of the sacrifice, and also the fraternity value across classes bound by the same faith. Any yet other implicit value – such as the reminder of the reality of the cycle of life. These layered countries of Asia, with our layered values and layered histories that don’t fit well into the binary rhetoric of modern single-issue* activism. Evil, or zero waste. Evil, or vegan. Evil, or organic. 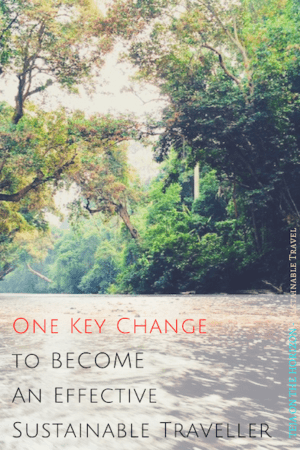 I am a sustainability advocate – but a collectivist* one. 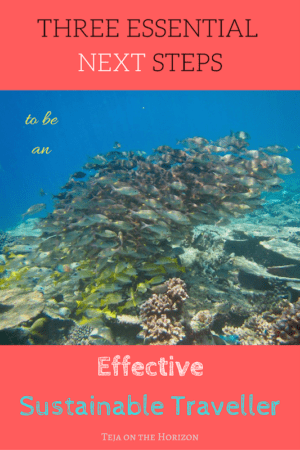 The collectivist way recognises a sliding scale, or multivariate approach, where you seek to increase value across multiple value priorities, or keep struggling to better and better selves, or reach a purer reflection of our dearest values. 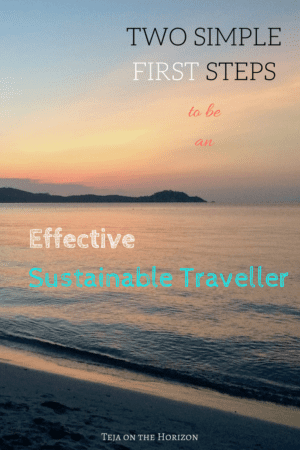 The collectivist way approaches philosophy like good travellers approach travel – the journey matters more than the destination. In a world where 90% of humanity hold between them less than 15% of all wealth, is it moral for someone in the remaining 10% to judge what the 90% should and should not eat? What lifestyle they should or should not aspire to? Ought I to impose ideas of a responsible lifestyle that is my moral obligation because I have privilege, as a universal ethic incumbent upon everyone, most of whom do not have even half my privilege? Or is it more helpful to prioritise sharing those sustainability ideas that can give people a hand up as well? As developing nations try to attain a better quality of life, they will look to those already there, to determine what is the lifestyle to emulate. Some environmentalists often recite this with a tone of foreboding. Frankly, it sounds a bit like you might be a willing Child of Thanos. So if what they see – and then copy – means that the earth cannot support civilisation – whose fault is that? If the best examples they see, contains no examples that they can culturally identify with, and so they copy unsustainable examples from closer cultures instead – whose fault is that? The aspirants, or the examples? * The collectivist worldview is typically tagged as the ‘Eastern’ worldview, as opposed to a more individualistic way to see the world – typically tagged as ‘Western’. By no means are the labels absolute; for example, I consider the Dutch approach to problems to be multivariate and rarely emotional or single-issue, whereas certain parts of South Asia can see the world in quite black and white terms. However, the demarcation has some justification, which can be seen in how the approaches are perceived in an individualist language, vs a collectivist one. Reserving judgment, opting not to generate or voice an opinion straightaway (or at all), weighing practicalities against ideals, tends to be described in English, for example, as ‘undecided’, ‘fence-sitter’, ‘opaque’ – all of which carries a slightly negative connotation. Whereas the same behaviour in Malay (and likely other Oriental languages), would be described in words that imply a wise person, careful and not hasty. This post brought a smile to my face and was very enjoyable to read. I wanted to bring home a penguin from my travels. LOL well at least a penguin would be more portable!